Sadly, summer in the UK seems to be prematurely expiring, so what better way to prolong the light days of sunshine than to hop across the pond and visit our friends on the Continent? Whether you’ll be enjoying sangria and tapas along the beautiful coastlines of Spain, embracing the history and immense architecture of the Colosseum in Rome, or swimming leisurely in the cool turquoise waters of Croatia, you can be sure to escape the gloomy grey clouds that threaten summer here in the UK. If you’re considering renting a car, there are a few things you need to consider before you go to ensure that your trip isn’t tainted. Luckily, we’ve put together a guide that should keep you safely behind the wheel if you decide to drive in Europe – so that’s one less thing for you to worry about. Its also important to double check if the country you’re planning on driving in has any specific laws. For example, in France you are required to carry a self-check breathalyser in your car at all times. Phones – Most European countries now specify that you can only use your mobile in the car with a hands free device. Children – Although specific details vary country to country, in most European countries, children up to the age of 10 must use some sort of child seat in the car. Up to the age of 3 or 15 kg weight they should be in a child seat, and up to the age of 10 they should have a booster seat. Check the specific laws of the country where you’ll be driving. Reflective Jacket – Certain European countries, such as Croatia, France, Italy and a few others insist that every driver must have a reflective jacket/waistcoat in their car, so it’ll be worth carrying one wherever you’re going. Minimum Age – Whilst some countries share the same minimum age for driving with the UK at 17, Belgium, Germany, Italy and many others specify that that 18 years old is the minimum age for driving. Tolls – In the UK there are only a handful of toll roads with roughly 20 tunnels and bridges that carry charges, and of course who can forget the notorious congestion charge in London? However, be aware that over on the Continent the situation is very different. When driving in Europe you are much more likely to encounter a toll road, in particular on the main motorway network. Tolls can add up, so it’s a good idea to do your research before you go so that you can factor toll road charges into your holiday budget. Valuables – It can be difficult to judge how safe an area is when you are in a foreign country, so we’d advise that you always make sure you don’t leave valuables in your vehicle in full view. It’s better to protect yourself and your possessions by removing all temptations for thieves. Drive on the Right – It may seem like an obvious one, but you won’t believe how easy it is to forget when doing something as familiar to most of us as driving. Make sure you think twice when leaving the petrol station or a car park, so that your brain doesn’t automatically take you to the left. Drinking – The laws on drinking and driving differ slightly depending on which country you are visiting, but the safest rule is simple – if you drink, don’t drive. The laws are strict and penalties are severe – some countries have a zero-tolerance policy on drinking, so the safest option is to avoid driving after drinking. Pets – If you are planning on travelling with a pet, call the Pet Travel Scheme (PETS) helpline. The number is: 0370 241 1710. They will be able to advise you on the entry requirements for your animal to travel with you. Emergencies – The European Emergency call number is 112 – you can dial this number anywhere in the European Union in case of accident, assault, or any other situation you deem an emergency. 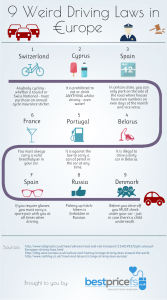 Weird Driving Laws – Check out the image to the right to find out about 9 of the weirdest driving laws in Europe. Hiring a car whilst in Europe should be an easy process, however it is essential that you take some time to make an informed decision in order to bypass any additional costs that can mount up. We advise that before signing a car hire contract you read it through thoroughly and make sure you enquire about any parts that you don’t understand. Make sure that you check for any extra charges. Its best to not just compare initial price quotes, as often, deals that look too good to be true ARE, as they require additional costs for add ons. You need to determine which company is offering the best combination of rates, including all fees and extras you want. Supplied Full, Return Full. This can work out very cost effective as you only pay for what you need, providing that there is a petrol station nearby your drop off point. However, be aware that service charges for filling the car if you do not return it with a full tank will be very high. Supplied Full, Return Empty. You’re charged up front for a full tank of petrol and you are able to return the car with whatever you haven’t used, as much or as little as that may be. If you are planning on doing a lot of driving this can be advantageous, and you won’t have to worry about finding a petrol station nearby your drop off point. However, if you aren’t going to use a full tank you could end up paying for more fuel than you need to. If you are given the choice, we suggest you consider how much driving you think you’ll be doing and where the nearest petrol stations are to work out what will work best for you. Finally, for complete peace of mind when hiring a car in Europe we would advise that you simply take your time – never feel pressured into signing a contract that you aren’t sure about! Also, in the case of any accidents, damage or breakdowns, make sure to inform the rental company immediately, and where possible try to obtain an accident report. Finally, don’t forget to enjoy the freedom and opportunity you will acquire from driving in Europe. As long as you’ve planned well, you’ll able to take each day at your own pace, travelling with spontaneity. The freedom of seeing a country by car allows you to really immerse yourself in its culture, and experience more than you would on a package deal. We hope that you found our guide to driving in Europe useful – have a safe, problem free, enjoyable journey, and to avoid the costs a breakdown in Europe can incur, check out our European Breakdown Cover.